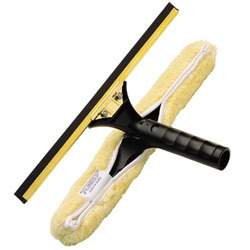 With the simple touch of a button, the BackFlip can be transformed to work in a variety of applications: as a One Pass Squeegee, combination Scrub & Squeegee or a separate Heavy-Duty Washer and Quick Release Squeegee. Each tool fits on all Ettore extension poles. The BackFlip is the only tool that works in four time-saving combinations with no parts to lose.